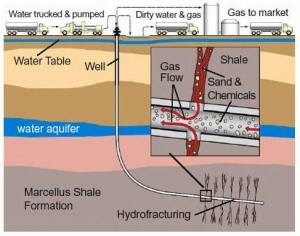 Hydraulic fracturing (fracking) is a technique used to extract hydrocarbons trapped in certain types of rock. In particular the widespread use of fracking is being driven by the expansion in shale gas extraction. Shale gas is natural gas that is trapped in impermeable shale rock, as opposed to more conventional natural gas deposits that are trapped below a layer of impermeable rock. Therefore simply drilling down to it is not enough and the rock must also be fractured in order to allow the gas to escape. Hydraulic fracturing uses pressurised fluid to free trapped gas. Wells are drilled and the fracking fluid injected into them under high pressure to crack the rock. The fracking fluid consists of water, sand and a massive amount of chemicals. Millions of gallons of water (and hundreds of tons of chemicals) are used to frack a well. The quantity of water involved in the fracking process in a climate of drought, water resource pressures and the needs of the agricultural community in Somerset. Where would fracking take place in Somerset? We are currently compiling our pages related specifically to the Mendips and potential hydraulic fracturing in Somerset. We are undertaking independent research and will upload the results shortly. 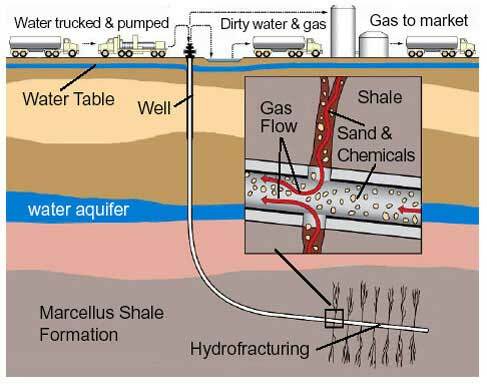 This page is a very brief overview of hydraulic fracturing and the associated risks. It is written for the general public in an attempt to explain some of the concerns. Please visit the resources section of this website to find out more and read technical reports related to fracking. We also have links to a number of videos that can explain the issues and demonstrate the points above.